What Are The Best Online Master's in Science Education Programs? What Else can I Expect from an Online Master's in Science Education Program? An online master's in science education prepares you to become a skilled teaching professional by building and expanding your understanding of educational theory and research. This degree program prepares you to work as a math, science, engineering, and technology (STEM) educator and teach you a deep understanding of evidence-based instruction, various pedagogical innovations, and a range of subject areas, including biology, chemistry, physics, and environmental science. Earning a master's in science education online also teaches you the skills needed to prepare young people for rewarding college and career experiences. Furthermore, the U.S. Bureau of Labor Statistics projects about 1.9 million job openings in the teaching profession between 2014 and 2024. NC State offers experienced educators the opportunity to enhance their teaching skills in science education at the pre-college level through their 36-credit MS in science education. The curriculum includes courses in the study of advanced methods in science education, tools for science teaching, and the foundations of science education. 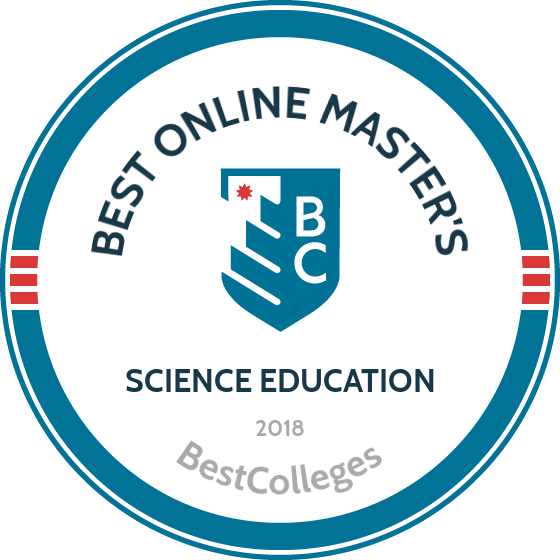 Students in the master's in science education online also take elective science courses and six credits in a focus area, which includes middle school education, informal education, special populations, and mentoring preservice/in-service educators. Applicants must have a bachelor’s degree with a minimum 3.0 GPA, GRE or MAT scores, and a minimum two years of teaching experience or equivalent in a science environment. The program can be completed with two years of full-time study and in three to four years with part-time study. The curriculum is applicable for students who want to apply for National Board Certification. New Mexico Tech offers math, science, engineering, and technology educators an online master of science teaching program that emphasizes content over pedagogy and the use of lab and field exercises to enhance learning. Students in the master's in science education online program improve their science and math skills and explore new innovations through coursework. Courses include math for teachers, problem-solving and recreational math, forensic geology, space science, great concepts in physics, and astronomy for teachers. Lesson planning is an integral part of the program, the courses are streamed through the internet. Students may be able to transfer up to 12 credits earned with a minimum 3.0 GPA from an accredited institution. Admission requirements include a bachelor’s degree and at least one year of teaching experience. Students are encouraged to have a valid teaching certification. The Fischler College of Education at Nova offers a master of science education that prepares science educators to teach in middle and secondary school settings. The 36-credit online program is open to science teachers seeking a graduate degree and students with a bachelor’s degree in an education field who would like to focus on science education. Courses in the master's in science education online include study of educational research for practitioners, methods in science education, teaching ocean studies, inquiry-based life science, and classroom management and organization. The curriculum, delivered through the Blackboard learning management system, is research-based and incorporates best practices in the field. An applied professional experience is required to complete the program, during which, students keep journals of their accomplishments in an educational setting, and keep samples of their students’ work and the assessments used to show that they have met state content standards. Admission requires a bachelor’s degree with a minimum cumulative 2.5 GPA. Hamline offers one of the few environmental education graduate programs. It prepares qualified leaders to promote stewardship of the planet. The 34-credit master of education in natural sciences and environmental education is completely online and offers opportunities for students to engage in research in their communities. The program includes courses in the study of the history of the environment, ecological systems, and the environment and society. Students can take a one-term capstone project with no requirement for data collection or a capstone thesis in which students engage in applied research study. The online master's in science education can be completed in 18 to 24 months. Graduates are prepared for roles as classroom teachers or to enter other occupations, such as museum director, naturalist, or zoo administrator. Hamline is one of only eight colleges in the world that is accredited by the North American Association of Environmental Education. Admission requirements include a bachelor’s degree with a minimum 3.0 GPA. UNK’s eCampus offers graduate teacher training programs that are delivered completely online and in hybrid formats. Among them, is the 36-credit master of science in education in science/math education. The program is designed for educators in grades 7-12 who want to enhance their classroom effectiveness. Educators have the option of choosing one of four areas of emphasis: chemistry, biology, math, or physics/physical sciences. The core curriculum of the master's in science education online includes courses in natural science, curriculum implementation, and education research. A science/math education capstone is required, which requires students to pass a comprehensive exam in their area of specialization. Classes are kept small to facilitate one-on-one attention; students can expect to receive services such as online tutoring, video tutorials, and continuous library services. Admission requirements include a bachelor’s degree, a letter of intent that outlines current teaching position and professional objectives, and evidence of a valid teaching certification or license. ECU has delivered distance education programs for 60 years and was one of the first in the nation to offer a degree entirely online. Students who want to teach science at a junior or community college have the option of earning a 36-credit MA in science education. The curriculum includes the study of science and society, approaches to teaching biological sciences, microcomputers in teaching biological science, perspectives on science education, and problems in science education. To apply to this master's in science education online, students must have a bachelor’s degree in science education or a science area. Admission requirements include acceptable scores on the GRE or MAT and a minimum 2.7 GPA on baccalaureate-level coursework or a minimum 3.0 GPA on courses taken during the senior year at the undergrad level. To graduate, a thesis must be submitted and students must pass a comprehensive examination on science education. Oregon State’s Ecampus is a leader in online education, providing students with access to rigorous programs that are delivered asynchronously for flexibility. The 45-credit master of education in advanced science and math education is designed for working K-12 educators. The program uses a cohort model that begins each fall. Core coursework includes the study of technology for teachers, research methods, and educational leadership. The science and math emphasis focuses on technology to enhance math and science learning and developing instructional technologies. Students in this online master's in science education are taught by renowned faculty that are known for their research and innovation. Oregon State also accepts up to 15 graduate transfer credits if they meet the program’s requirements. Admission requirements include a bachelor’s degree with a minimum 3.0 GPA, at least one year of teaching experience, and access to a classroom to apply learning. New applications are currently on hold; contact the school for more information. WGU, established in 1995 by 19 state governors seeking to innovate the delivery of higher education, is a virtual campus with a full catalog of competency-based programs for educators. The MA in science education is designed for licensed teachers who want to teach science in grades five through nine. The curriculum, recognized by the National Science Teachers Association, includes the study of general science content, science education, biology, and geosciences. It can be completed in two years, but students can complete it quicker because of the school's competency-based curriculum. The online master's in science education requires 31 competency units and a teacher performance assessment for completion. Students have access to a mentor and can use career services to develop a career plan. Learners have the opportunity to connect with students through online learning communities. GRE or GMAT scores are not required. Admission requirements include a bachelor’s degree and a valid teaching license. Lesley's interactive master's in science education is designed for educators seeking to deepen their knowledge of science education. The 33-credit master of education in science education incorporates strategies for equitable learning in science, assessment, and retention. Required courses include life science, physical science, engineering STEM solutions, earth and space science, and science education research seminar. The curriculum, which is aligned with state and national science standards, includes a number of electives, such as teaching about natural disasters, green chemistry, and infectious disease. The program is delivered completely online in accelerated eight-week terms, and online students have access to learning tools and resources. The program is applicable for educators who already have licensure and students who don't plan on pursuing licensure. Admission requirements include a bachelor’s degree and initial teacher licensure if pursuing professional licensure or a signed non-licensure agreement. A graduate degree from WMU’s Mallinson Institute for Science Education, one of the top science education institutes in the nation, prepares graduates for many different careers. The 30-credit MA in science education curriculum was designed for elementary and high school teachers who want to specialize or enhance science teaching expertise. Courses include the study of the history and philosophy of science, cognition and teaching, the science curriculum, astronomy, and earth science. Students can also choose electives to design a plan of study that addresses their particular interests. The online master's in science education also prepares graduates for entry into doctoral science education programs. Coursework is delivered completely online or in a hybrid format. Applications are accepted on a rolling basis. Admission requirements include a bachelor’s degree. No GRE is required. While pursuing a master's in science education online, you will learn how to address students' educational needs by engaging in scientific problem solving; these lessons can subsequently be incorporated into your instructional practice. While the exact curricula depends on the school and program you select, your new-found scientific knowledge can be combined with an understanding of student assessment techniques and equitable learning strategies. Learners examine evolution, energy, and systems and interactions as they connect the concepts of biological, earth, and physical sciences. This connected approach enables educators to more effectively teach these themes to students. These skills are necessary to succeed as an elementary school teacher. Students develop the knowledge and techniques necessary to deliver instruction to secondary school students. This course includes theory and practice that are specifically geared toward this population of learners. These are skills necessary to work as a high school science teacher. This course explores topics in earth science with special attention paid to leadership instruction and peer teaching. Participants engage in field projects while learning teaching strategies for educating K-12 students. These skills are required to pursue a career as a museum education specialist. Degree candidates learn how to create curricula that emphasize the application and evaluation of best practices with a focus on local and national science education standards. Students also learn how to ensure smooth transitions between grade levels and subject matter. These skills are necessary to work as an instructional coordinator. Students cover assessment objectives, the tools needed to perform assessments, and the differences between formal and informal assessments. In addition, they learn how to interpret assessment data to strengthen their teaching abilities and improve student performance. These skills are needed to teach community college. HOW LONG DOES IT TAKE TO GET AN ONLINE MASTER'S IN SCIENCE EDUCATION? The time required to complete your master's in science education online depends on the program you choose, the school in which you enroll, and the number of credits you earn each term. In general, earning an online master's in science education requires between one and two years of study. The decision to attend class part-time while working full-time also influences how long it will take to finish; fortunately, most online programs allow you to pursue a degree at your own pace. While enrolling in an online program allows you to attend classes at your convenience, some schools may require students to take synchronous courses at a specific time in order to provide a cohort learning experience. This requirement can also affect the length of a program depending on what classes you are required to take and when you can take them. It is important to make sure that you earn your online master's in science education at an accredited institution; this accreditation means that an education authority, like the U.S. Department of Education (ED) or Council for Higher Education Accreditation (CHEA), has evaluated and determined the quality of a school's curricula. Employers look favorably upon graduates of accredited schools; they are assured that an external body has verified the intellectual rigor required to obtain a degree from those institutions. The ED and CHEA recognize six regional accreditation bodies that accredit schools across the country: Middle States, New England, North Central, Northwest, Southern, and Western Associations of College and Schools. Most institutions are regionally accredited, but CHEA also approves some agencies to award national accreditation; this is usually reserved for a specific kind of education like vocational and distance learning. Both the ED and CHEA closely monitor the academic quality of institutions. The ED reviews accrediting agencies and ensures that they enforce accreditation standards. The CHEA is comprised of 3,000 degree-granting colleges and universities and recognizes 60 institutional and programmatic accrediting organizations. The ED and CHEA each maintain a list of accredited institutions on their respective websites. In addition, you should look for a school that has been accredited by the Council for the Accreditation of Educator Preparation (CAEP). The CAEP advances equity and excellence in educator preparation by assuring that schools continuously improve their curricula and provide a quality education. Your online master's in science education training prepares you to be an educator in both formal and informal learning settings, including schools, museums, and afterschool programs. You will gain the intellectual and practical knowledge needed to help your students understand a range of subjects and support their academic growth. In addition, your abilities to think critically and innovatively will enable you to effectively reach younger learners and ensure their immediate and long-term success. This career prepares young students for future schooling by helping them learn fundamentals, including science education. These professionals develop lesson plans, deliver instruction, and observe and assess students' performance. An advanced degree enables educators to perform these tasks more effectively. In addition, an elementary school teacher is responsible for communicating a student's strengths and challenges to their parents and report on their progress. A high school teacher develops and delivers lesson plans, grades and assesses students' performance, and works one-on-one with students to ensure that they understand a range of subject matter, including science education. High school teachers also prepare young people for college and/or their careers by making certain they possess the competencies necessary for success as an adult. An advanced degree helps prepare teachers to do this. Workers in this profession conduct public service activities for museums, including workshops, seminars, and camps. Museum education specialists come up with programmatic strategies for new education programs as well as gallery activities that relate to permanent and special exhibits. These museum initiatives engage school and family groups and make complex information easier to understand; an advanced degree in science education teaches educators how to better convey ideas to a wide range of audiences. An instructional coordinator oversees teaching standards and school curricula to make certain that educational institutions effectively support student learning. An advanced degree allows workers in this career to analyze student data and recommend professional development techniques to teachers to help them deliver high-quality instruction. Instructional coordinators also review and recommend textbooks and other course materials. In addition to designing lessons and teaching high school graduates, community college instructors sometimes lead research activities and publish scholarly papers; an advanced degree prepares them to do this. Community college instructors also frequently work with their colleagues to develop and/or modify the degree requirements for a program of study. Your salary after earning a master's in science education online depends on your occupation and years of experience. A career in education can be professionally, personally, and financially rewarding, even during your entry-level years, and your salary increases as you gain experience. Moreover, the Bureau of Labor Statistics reports a highly positive job outlook for education careers, projecting nearly 2 million more jobs by 2024. Completing the Free Application for Federal Student Aid (FAFSA) is the first step that you should take if you need financial support to help you pursue your master's in science education online. A part of the ED, Federal Student Aid provides federal grants, loans, and work-study funds to help students pay for college. In addition, you can check with your school's financial aid department to learn about specific scholarships and fellowships. You might also qualify for reduced tuition if you are an active member or veteran of the U.S. armed services.